To Persist or not to persist — that is the question? Persistence is an interesting quality in a person. Every once in a while, I get asked why I keep bothering in the arts. Such an odd comment to make, I still cannot quite get my head around it. It is like someone is trying to invoke a state of failure or apathy. It’s almost like asking: why do you bother to keep putting your shoes on every morning? The answer applies to both; if I don’t, I won’t get to where I want to go. But when is enough, simply enough? How do you judge when you want to stop or to even slow down? Well, only you can decide on that. But you can be sure on one thing, that if you decide to stop — to cease persisting — it is a cinch that you will NEVER make it — in anything! If I had a pound for every one that told me that I would never get anywhere in the arts, I really would have a large bonus added to my bank account. Believe it or not, before leaving school, I had a chat with my careers teacher. She informed me that I would never make it onto TV in the acting world, which was my first choice — but I actually did — by being persistent. She also told me not to get into computers as they would never take-off and that it was just a passing fad! What great vision she had! So, the lesson here is: you should always keep your own counsel and follow your heart. Sprinkle that with some persistence and boom, you are over halfway there! Now, I also had the good fortune to hang out with my American friend and TV actress, Marisol Nichols the other week. Our chats got me thinking on the subject of persistence. 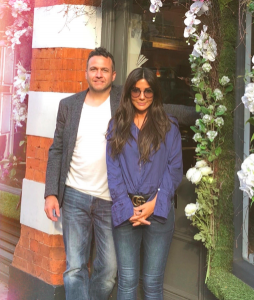 We spent the day wandering around London, where I had the chance to take her to some of the key sights. 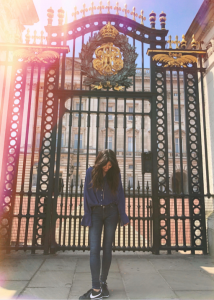 I took this arty photo below of her outside Buckingham Palace. A note about success. 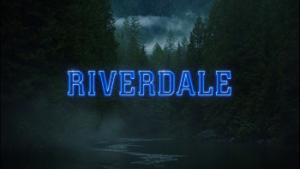 I’m so grateful for a Season 2 of #Riverdale and even more grateful to be on a show that so many fans have embraced. I’ve been acting for quite some time and had my share of ups and downs within the “business.” Pilot seasons where there were so many auditions and opportunities that I couldn’t see straight. Some resulted in shows, some resulted in heartbreak. I don’t think there’s a secret really, to Hollywood. I think it just takes persistence. And not giving up. Just like anything in life. Wanting something enough that you’ll never stop working hard for it. And no matter how many “No’s” you get no matter how many stops that get in the way, you just don’t give in. You don’t give up. And you keep going for it. I don’t know what the future is beyond Season 2 of #Riverdale but I know I’m damn grateful to be able to go to work and do what I love with people I love. I saved all the auditions I went on in between my last series and this one. And each audition, I tried….hard. And for whatever reason…it just didn’t happen. 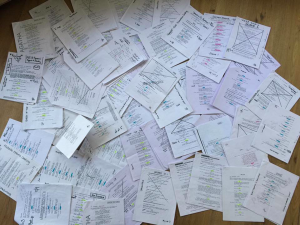 So I took this picture (at the top of the page) of all my auditions when Riverdale got picked up for its first season…as a reminder. And I think it applies to anything in life, any job…any goal. Never take it for granted and never stop believing hard work and persistence pays off. So until next time, I shall persist with my next book… ??? ?